Foliage. See photo from Floradata. Allium is the Latin name for 'garlic'. "ampelos" is "a vine", o is a connective vowel in botanical Latin; "prason" is "leek"; "um" is Latiniziing nounal suffix. It was part of the staple diet of the Egyptian pyramid builders. 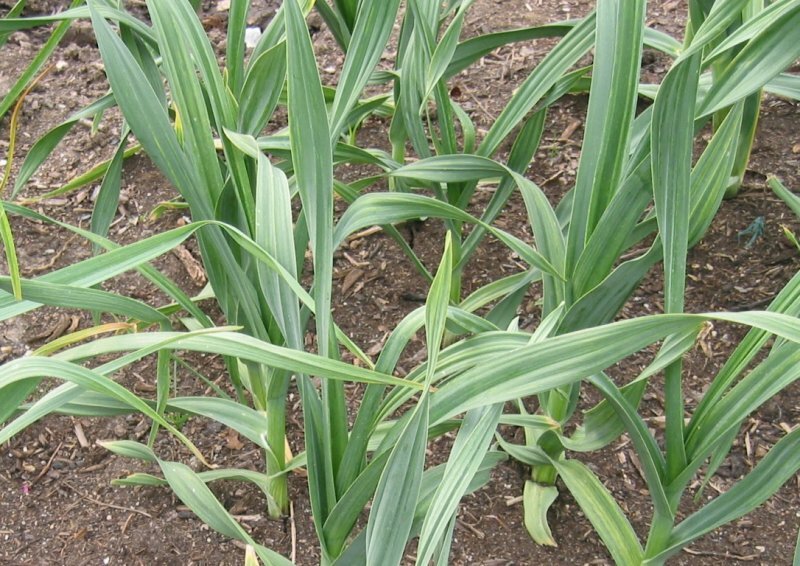 It has been differentiated into three cultivated vegetables, namely leek, elephant garlic and kurrat. In tidewater Virginia, the plant is commonly known as the “Yorktown Onion". Elephant Garlic, Great-Headed Garlic, Levant Garlic, Wild Leek, Spanish Allium. Chalk or Sand (Well-drained soil required). Its habitat consists of rocky places near the coast in south-west England and Wales. Allium ampeloprasum is native to Southern Europe and West Asia. "Edible flowers, leaves and roots." from R.V. Roger. The juice of the plant is used as a moth repellant. Master Gardeners Journal provides growing details for gardeners. Protobase gives agricultural growing details. "Flowers are urn-shaped, up to 6 mm across; tepals white, pink or red; anthers yellow or purple; pollen yellow from Wikipedia. "Easily grown in deep, organically rich, medium moisture, sandy, well-drained loams in full sun. Plants perform best with consistent moisture during the growing season." from Missouri Botanical Garden. "It does not produce bulbils. It is an “environmental weed” in parts of Australia." from Encyclopedia of Life. "Wild Leek colonises sandy edges of fields and coastal paths, but these plants can also be found on fallow farmland further inland. At first the inflorescence appears in an almost perfect globe, but as the flowers age they droop forming the rather attractive waterfall effect." from First Nature.